Everyone together now, on the count of three. Ready? I think I might have been the last person in the Capital Region to understand the appeal and popularity of avocado fries from Slidin' Dirty (which has a location in Troy, along with a roving food truck). 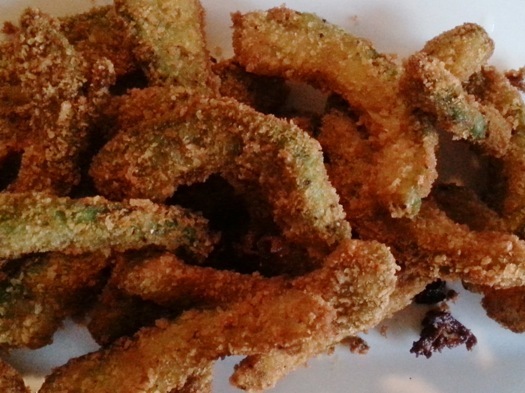 I can barely utter the words without someone interrupting with, "Oh my gosh, avocado fries. My favorite." Sometimes they actually drool, too. And since this column is designed to highlight great food in the Albany area, it would be antithetical not to take a moment to appreciate the avocado fry, an ingenious use of a humble fruit that makes everyone from small children to large, bearded, beer-loving men giddy with delight. It took me an embarrassing long time to try out the avocado fries. It was less than two weeks ago that I actually first enjoyed them, at Slidin' Dirty's first anniversary party of their Troy brick-and-mortar outpost. I was dining with my kids, and one thing I've learned as a parent (especially with one child who is a picky eater) is that if you put avocado or guacamole on something, they'll eat it. There is a 24-hour guac operation in my house, as it's an easy way to add color and vegetables to any meal. Anyway, I order the fries because I figured it would be an easy thing to appease the finicky palate among us. Regardless, I ate one. And then another. And another. And before I knew it my children were chiding me for the sheer velocity in which my hand moved from plate to mouth with these burnished green morsels of creamy, zippy deliciousness. I understood what everyone has been talking about. 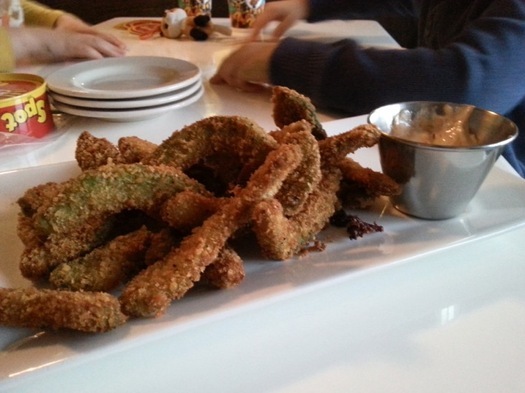 Slidin' Dirty lists the avocado fries on the menu as "Fravos" ($10). They're thick-cut slices of avocado, akin to a steak fry you might see with a potato, coated in a seasoned panko breadcrumb mixture before being deep-fried just long enough to crisp up the exterior and warm the insides without leading to avocado goo. A near-perfect example of how important balance in texture is in food. The chipotle cream dipping sauce was piquant and a nice complement. I'm pretty sure it was just the adobo sauce that chipotle peppers are canned with, mixed with mayonnaise, but I've never been above taking two underrated items and creating an amalgam of flavor and vibrancy. Avocados are having their moment in the spotlight, but the avocado industry as a whole is experience hardship due to drought and climate change. (I'll save the whole discussion on Pinochet and Latin American politics for a few beers and an order of avocado fries at Slidin' Dirty.) Still, avocados continue to be highly popular, with more than two-thirds of Americans purchasing avocados on a regular basis, according to studies noted in the link above. Think beyond the potato for your fries, and beyond guacamole for your avocado. Slidin' Dirty did, and in this month when being thankful is on our minds, that's something we can all be thankful for. Avocados are so damn tasty just the way they are. Though... I may have just changed my mind. Ama Cocina in downtown Albany also has good avocado fries. Noticed my own typo -- complement, not compliment. I swear I know the difference between the two. Oy. @Aunt Bea -- I was of the same mind, but give them a go. You'll be happy you did. Editors: Fixed. That was a copyediting fail on our part.